Cannes, France: A boy who takes his parents to court for having him is one of a wave of Arab films making people sit up and take notice at the Cannes film festival. Not since 1970 have two Arab films been in the running for the Palme d´Or top prize and female Arab directors are particularly making a splash this year. Lebanese film-maker Nadine Labaki´s highly-anticipated third film "Capernaum" -- about a 12-year-old boy with an axe to grind about being born into a miserable, loveless existence -- has racked up a string of distribution deals ahead of its premiere late Thursday. And two first-time female directors made impressive debuts with films about suffocating social conventions in Syria and Morocco. But while the #MeToo movement continued to make waves, with several Hollywood actresses ditching frilly frocks for pants for their photo shoots, Arab film-makers appeared more concerned with social alienation. Labaki, who set her first film "Caramel" in a Beirut beauty parlour, zooms in on neglected children and migrants in "Capernaum", which has drawn comparisons with Charlie Chaplin´s story of a street boy, "The Kid". Labaki said she found the idea staring her in the face one night when she was driving home from a party. "I stopped at a traffic light and saw a child half-asleep in the arms of his mother, who was sitting on the tarmac begging." The encounter spurred her to use a mostly hard-up, amateur cast including a Syrian refugee child for the lead role. Going toe-to-toe with her and the likes of Spike Lee for the Palme d´Or -- won only twice in 70 years by Arab directors -- is A.B. Shawky, with his feel-good first feature about an Egyptian leper and his orphan friend, also played by amateurs. A year after the award-winning "The Nile Hilton Incident", a noirish tale of murder and corruption set during the 2011 revolution in Cairo, "Yomeddine" serves up less political fare. "What I really want to do is highlight marginalised groups. I wanted to give a voice to people who don´t necessarily have anybody to speak for them," said Austrian-Egyptian writer-director Shakwy. Similarly, the Moroccan entry about an unmarried woman threatened with jail for falling pregnant is actually more preoccupied with class divisions. The film shows a middle-class, 20-year-old from a Casablanca family scrambling to avoid bringing shame on her family after an unwanted pregnancy. The real victim in the affair, however, is not the one left holding the baby. "I found that the debate about the condition of women in the Arab world was being reduced to the issue of patriarchy and chauvinism, which to me falls short of the mark," director Meryem Benm´Barek told AFP. "Whether you are a man or a woman, what determines whether or not you are a victim is your social status," she said. Tunisia director Mohamed Ben Attia´s "Dear Son", about a father trying to trace his son who has run away to join the Islamic State group, is also more family drama than a political broadside. The birthplace of the Arab Spring, which has been mired in economic crisis ever since, is estimated to have supplied more jihadists in Syria than any other country. Ben Attia, who won acclaim with "Hedi", about a young man torn between duty and passion in the wake of the Jasmine Revolution, tries to tease out the malaise behind the lure of IS for disaffected Muslim youths. Like Labaki, Shawky and Benm´Barek, he believes the story could be transposed to many parts of the globe. "There is a sort of misery, not only spiritual but emotional, not so much a thirst for ideology as a desire to walk away from this lifestyle... and all the values that are foisted on us. "They could be living in Paris or elsewhere, it´s the same," Ben Attia added. War and unfulfilled desires also collide in the Syrian film, "My Favourite Fabric", the first film of Paris-based Syrian director Gaya Jiji. French-Lebanese actress Manal Issa puts in a standout performance as a sullen young Syrian fantasising about sexual abandon and escaping to the West as the war drums begin to beat in early 2011. 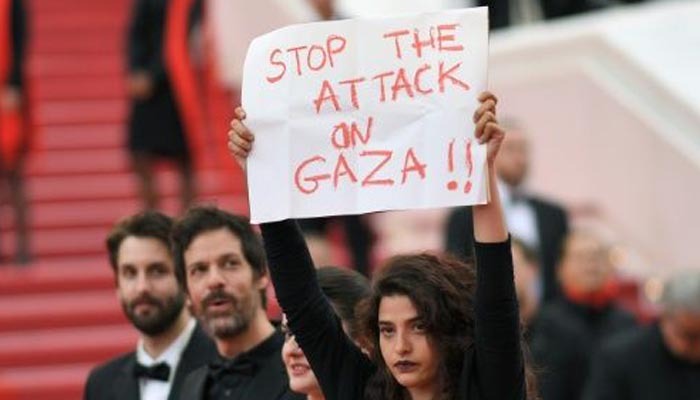 She carried her protest over onto the red carpet at Cannes, where she held up a placard reading "Stop the Attack on Gaza". Gaza also made it onto the big screen, in a documentary by Italian filmmaker Stefano Savona about the massacre of an extended Palestinian family in 2009 that received rave reviews. With Saudi Arabia unveiling big tax breaks for filmmakers at Cannes and the women behind the Doha Film Institute drawing praise from Hollywood star Salma Hayek, Arab cinema may be entering a new era. Is Prince William Cheating On Kate Middleton With Her Best Friend?